Today’s guest post is by Mia Choiniere. Former Canadian Minister of Parliament (MP) Stockwell Day arrived at a press conference on a personal watercraft in Penticton, B.C. in September 2000. Photo credit: Adrian Wild/CP. Discussing politics has always been an abiding passion for me. It all began with the Canadian TV show “Royal Canadian Air Farce,” which poked fun at Canadian elected officials from the 1990s to the early 2000s. I loved watching the Air Farce crew transforming political satire into sport – for instance, by firing off rubber chickens and other comical projectiles at whomever was voted Most Annoying Public Figure of the Week. My favourite funny moment in Canadian politics was when image-conscious Member of Parliament Stockwell Day jet-skied to his first press conference sporting a wet suit. Does it get any better than that? My interest in politics has dovetailed nicely with my other passions: human rights and international development. Naturally, one cannot be a human rights advocate while turning a blind eye to the political nature of advocacy. Through my work in international development evaluation, I have interviewed activists in countries as diverse as Tanzania, Thailand and Bangladesh. I have also volunteered with human rights NGOs in Canada, the UK, Vietnam and India. I have therefore met a fair number of like-minded “political junkies” across the world. 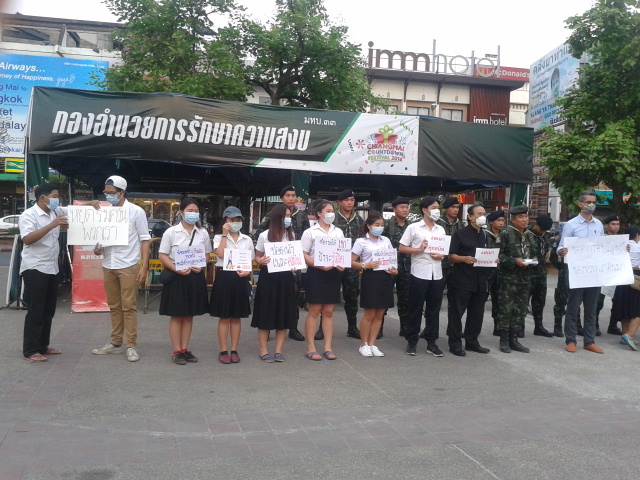 Students and soldiers in Chiang Mai, Thailand, wear face masks to protest high air pollution brought on by the burning of agricultural waste. March 2016. Photo credit: Mia Choiniere. In addition to learning about local culture and customs, it is my opinion that becoming familiar with local politics and policies is one of the best ways to understand a country. For instance, I ate bandeja paisa and tried my hand at salsa dancing in Colombia, but what really changed my perception of the country was learning about progressive social reforms and public transit innovations in Bogota. Similarly, I enjoyed taking cooking classes and visiting Buddhist temples while traveling in Thailand, yet my perception of the country as some sort of Southeast Asian Utopia was challenged when I learned about a conflict in the southernmost provinces of Thailand, which has claimed over 6,000 lives in the last 10 years mainly due to bombings and attacks committed by separatists and counter-insurgents. A question I have asked myself is how does one become a “political tourist” without getting anyone in trouble? In most Western countries (and some Eastern democracies like India), it is usually not a problem to talk about politics. These countries enjoy a high level of freedom of speech. For instance, I can talk your ear off about misguided Canadian policies, while Americans need no prompting to debate the outcome of their next presidential elections. Few people in the Western World worry about being overheard or whether expressing their views will impact their reputation, job and/or safety. However, I have had political discussions with activists in countries such as Bangladesh, where expressing one’s opinion can get you into major, major trouble. I once interviewed a group of Bangladeshi NGO staff who offered the most impassioned critique of their government’s refusal to acknowledge the existence of homosexuality. I admire their bravery because, in their shoes, I would have been reluctant to say anything at all. In Bangladesh, blogging about politics can actually get you killed. At least four secular bloggers were murdered in 2015, after criticizing extremist Muslim ideologies and promoting progressive causes such as women’s rights on Facebook. A responsible traveler would not consciously put anyone at risk for sharing their political views. At the same time, some of my most rewarding travel experiences have involved debating politics with friends from another country. I believe it IS a good idea to ask questions, to be curious and to be political – while being smart about how you go about it. With this in mind, here are my tried-and-true tips on how to satisfy your love of politics while traveling and at the same time never putting your friends at risk. 1). Use your common sense to decide when it is appropriate to engage in a political discussion, and when in doubt, ask. If you plan on publishing a newspaper article or a post on social media, be careful of using names to avoid getting anyone in trouble for sharing their views. 2). Read up on your own about the country’s political situation and human rights record to avoid making faux pas or wrong assumptions. 3). When used smartly, social media can be a great tool to talk politics. Twitter played a big role in spreading information during the Arab Spring after all and it is a good way to share resources while remaining more or less anonymous. Ask your friends what online resources they would recommend to learn about the latest political scandal or event in their country (this is also a good way to discover how they feel about their elected or unelected officials). 4). Ask about the issues you truly care about, and be prepared to contribute with your own thoughts and ideas on this topic, whether it is on democracy, the environment, disability rights, anti-poverty initiatives, and so forth. 5). Be prepared to back down if you feel that the conversation is making your interlocutor uncomfortable. Never push for information that the person you are speaking with does not want to offer. 6). Be honest about your intentions. Do you want to learn more about this topic for your personal information? In order to support a civil society organization with their work? Because you want to write a paper on the topic? 7). Recognize that your personal views and those of the locals may wildly vary. This is what makes the conversations so fascinating. With apologies to Stockwell Day for bringing up the Jet Ski incident once again. What are your views on talking politics while in a country other than your own? Do you have any experiences to share? Leave a comment on the blog!